Of course the 64-bit upgrade by a mile is the most important thing the game needs it ASAP! a couple other off topic little things id like to see either in a mod or update is the ability to turn the damage on or OFF! and also the camera zoom in and out further like we had on spintires plus. With only 32bit we can only utilize 4gb of ram. It's 2018, we need 64bit support to utilize more ram, make better mods and so on. Let's make spintires mudrunner Great Again! @Iyagovos Thank you. I also want to voice my support for upgrading the game to 64bit, it just makes good since. It needs 64bit. Really no reason not to have it support it. Hopefully they will listen to the community on this and not go Oovee on us. I sometimes have errors/crashes wich I think are related to lack of memory... so if adding 64bit support equals more memory, I’m all in for it!! Another thing i would like is the possibility of map display on a second monitor. Thanks for this great game, make it future proof! Agreed. This game needs the 64BIT update. On top of the gains you get, hardly anyone runs a 32BIT system anymore. On top of that, we also need the sound sync, light sync, and for me personally, the massive crashing issues. Every time I try to load into a map with mods, the game crashes. Tried different mods, different maps, uninstalling and reinstalling everything INCLUDING the game itself. It occasionally crashes when I load in any map with the default trucks too. I love this game. It's amazing. It just needs to be improved. reason why you are crashing is because the base game is pretty much hitting that memory limit that 32bit.exe's have, the 64bit.exe would give you a lot of room to work with. We absolutely need 64bit ! This has been an issue for a long time for me and is becoming increasingly worse as my trucks become more detailed. I have so much physics stuff on my trucks that now adding more detail in my models and textures renders the game playable for maybe 30-40 mins tops before I run out of memory with mine and a buddies truck loaded... and i crash to desktop. Runtime error. Basically limited to 1024x1024 texture sizes(due to out of memory crash when caching large textures)heard through the grapevine pavels fix for this is to change editor to "optimize" textures to a max 1024x1024 size. This is crap....The editor is in desparate need of an ovehaul aswell. I feel that the games developer's should consider listening to the people whome have kept this game afloat for 3+ years through all the bull crap.... think it would be a smart choice considering the console version is losing support due to lack of mod support. That said back to the subject if this game is to ever expand it has to upgrade to 64bit. Would increase physics computations to allow for better variety of off-road scenarios. Idk why we should be limited to the original developer's homeland as a theme also! Add some palms and mangroves and palmettos for goodness sake! Let's have some different biome options! More memory could help here as well. Lights are synced with mods sounds I'm sure could be also. The horn is wtf? Come on bro can't do it.....pfft ("won't") as with plenty of other issue's. I'm done now, cheers to the thread starters got your back 100% on this fellas! Thanks for reading! 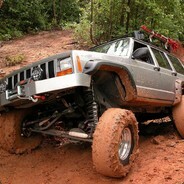 4yrs Modding experience in Spintires. If it don't fit.....force it! @jesse What issues are you currently seeing with the game?